Here’s a little surprise from today’s AWS re:Invent keynote. 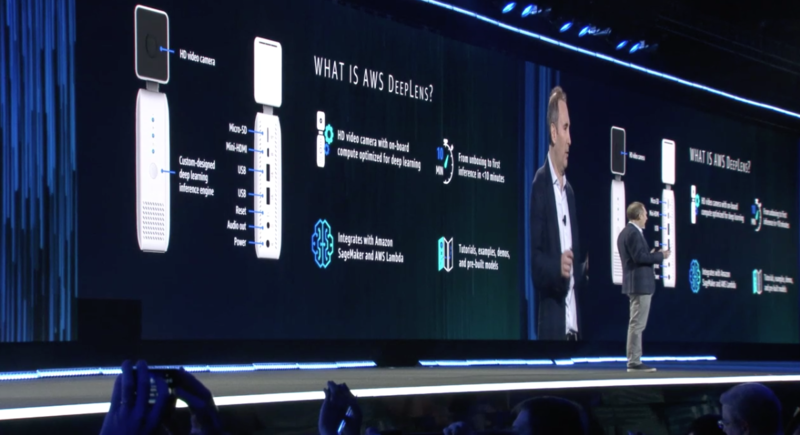 In an event peppered with talk of containers and bizarre musical interludes, Amazon introduced its AWS DeepLens camera. The device functions similarly to Google’s recently announced Clips camera, utilizing AI to grab better shots, only Amazon’s version is targeted specifically at developers. The video camera was designed as a way to help developers up to speed with Amazon’s various forays into AI, IoT and server less computing, according to the company. Amazon also hopes it will help convince developers to create apps using its AWS Greengrass and AWS Lambda services. The hardware is, unsurprisingly, a fair bit less elegant than the Clips device Google showed off a few months back, but it’s got all sorts of connectivity on-board, including a micro HDMI and two USB ports, along with dual-band WiFi. It’s got an Intel Atom processor and 8GB of RAM inside, running Ubuntu. The camera itself is 4GB, capable of shooting in 1080p — nothing spectacular, but then, this is a developer device. What’s probably most interesting here are the pre-trained models that do all sorts of image recognition, including facial, cats and dogs and inanimate objects, including hot dogs, the company writes, winkingly. AWS provides an online template leveraging those technologies — it looks to be a fairly user friendly interface where developers can build on top of pre-configured projects and plug in various functionality. DeepLens is available for pre-order starting today. The company will be demoing the hardware for developers at today’s show. It’ll run $249 — not coincidentally, the same price as Clips.